Brynne Chandler is an avid runner, swimmer and occasional weight-lifter who fell in love with all things fitness related while writing TV Animation in Los Angeles. Her passion for healthy living and fascination with nutrition led to taking classes at the University of California Northridge, working with chefs, caterers and inspired her second career writing non-fiction and instructional articles. Brynne is hard at work on her first cookbook which combines simple, fresh recipes with science-based natural health remedies. 3 Ballerina Tea is not made from actual tea leaves. This particular herbal diet tea has only two ingredients: malva verticillata and cassia angustifolia, known respectively as Chinese mallow and senna. Neither herb contains caffeine or ephedrines, but they are both powerful laxatives and diuretics. Be sure to discuss this with your physician before using. Follow the directions on the box and monitor your physical reactions, because overuse, or use by people with sensitive systems, can cause problems. Herbal teas do not agree with everyone. Both Chinese mallow and senna are fairly powerful laxatives and diuretics, and your system may react strongly to them. The reviewers at DietSpotlight.com caution that some users have experienced nausea after drinking 3 Ballerina Tea. Laxatives such as Chinese mallow and senna lubricate the mucous membranes of the bowel, encouraging elimination. This can be beneficial if you are constipated. However, according to the Mayo Clinic, prolonged use of laxatives can cause dependence, making it impossible for your bowels to work properly without help. Both senna and Chinese mallow act as diuretics, which means that they encourage you to urinate. This can result in an initial loss of water weight, but if you do not make sure that your fluid intake stays high enough, dehydration can occur. According to Dr. Andrew Weil, “Prolonged use or abuse of any diuretics without medical supervision can lead to dehydration, which can cause kidney damage and an imbalance in normal levels of electrolytes like sodium and potassium, which are vital to heart, kidney and liver function. When electrolytes are out of balance, you're at high risk for heart failure and sudden death.” Make sure you drink a minimum of 64 oz. of water per day while using 3 Ballerina Tea. Dr. Andrew Weil: Natural Diuretics for Fighting Fluid Retention? What Are the Dangers of Senna Tea? 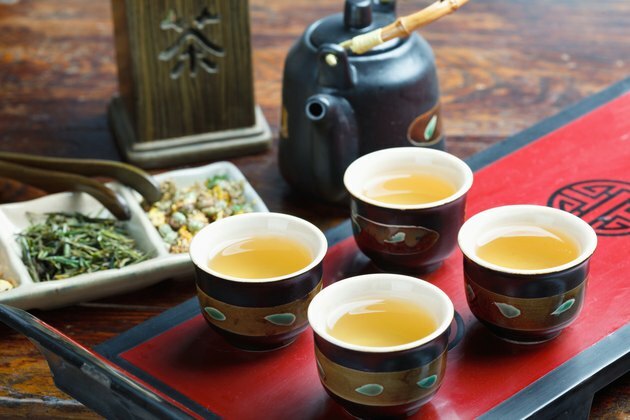 What Happens If You Drink Slimming Tea on an Empty Stomach?